Grand Central Life & Style, 9781455533862, 384pp. Forget everything you've been taught about dieting. 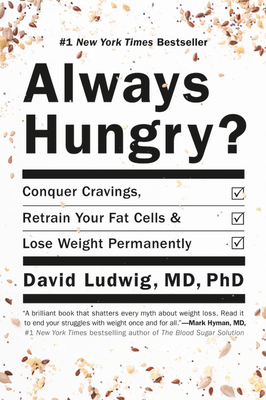 In the New York Times bestseller ALWAYS HUNGRY?, renowned endocrinologist Dr. David Ludwig explains why traditional diets don't work, and presents a radical new plan to help you lose weight without hunger, improve your health, and feel great. For over two decades, Dr. Ludwig has been at the forefront of research into weight control. His groundbreaking studies show that overeating doesn't make you fat; the process of getting fat makes you overeat. That's because fat cells play a key role in determining how much weight you gain or lose. Low-fat diets work against you, by triggering fat cells to hoard more calories for themselves, leaving too few for the rest of the body. This "hungry fat" sets off a dangerous chain reaction that leaves you feeling ravenous as your metabolism slows down. Cutting calories only makes the situation worse-creating a battle between mind and metabolism that we're destined to lose. You gain more weight, even as you struggle to eat less food. David S. Ludwig, MD, PhD, is a practicing endocrinologist and researcher at Boston Children's Hospital, Professor of Pediatrics at Harvard Medical School, and Professor of Nutrition at Harvard School of Public Health. Described as an "obesity warrior" by Time magazine, Dr. Ludwig has been featured in the New York Times and on NPR, ABC, NBC, CBS, and CNN, among others.